A catastrophic plague has left a trail of destruction across 14th century Europe. Survivors confront sickness and scarce resources in a land rife with banditry. To survive you will need to fight for scarce resources including food and learning new crafting techniques will certainly improve your chances. But in the desperate times, you will need to defend yourself in a land full of bandits looking to profit at your expense and at all times you MUST avoid the plague. Conditions are harsh, times are dark - this is the land of ‘The Black Death’. 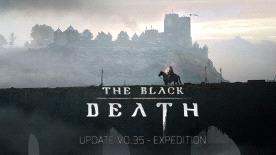 The Onslaught update includes lots of new features, systems, and changes to The Black Death. There are updates to the movement system, new combat abilities, revamped Item quality system, Quick Slot Bar, dragging & dropping in menus, loads of UI updates. new pillage areas and more! Was it God or was it the devil himself that despatched this evil plague on Europe’s population? No one knows for sure, but everyone knows that it will kill. Watch as the plague slowly rolls across the towns and countryside. If you find yourself in a plague area or are in contact with a plague victim, it is only a matter of time until you will succumb. Take advantage of different realistic medieval professions: Crafting fine armors to protect yourself from deadly raiders as a Blacksmith, taming animals and farming the land as a Peasant, tricking players with counterfeit goods as a Bandit, and much, much more. Try to rebuild society by building a homestead by yourself, or with friends. Develop your building skills and turn a rickety shack into a powerful estate, complete with an ultimate medieval research lab to help you perform your experiments and find a cure. A huge open world (8km2) based in 14th century Western Europe. Explore thriving castles, bandit camps, busy ports and abandoned mines. A living world with hundreds of NPC’s and day / night cycle. Trade with merchants, hunt animals, talk to townsfolk and fight bandits. Over 300 in game items. Craft over 40 different weapon and armour pieces, using medieval tools and utilities. Buy deeds to houses, upgrade them, and hire staff to work on your estate. Learn skills from a number of different professions to help you survive. Learn more about the plague through physical examinations and autopsies of infected animals and humans.